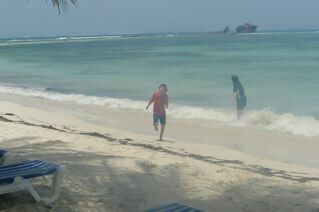 We spend 2 more days in San Andres. 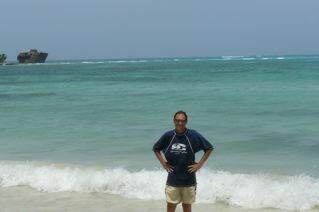 The first of those we go back to Johnny Cay to make up for our first visit being cut short. We get the cheapest possible transport out, which happens to be on a boat full of workers setting up for the day. It’s quite a ride, as we’re packed tight between all the supplies being taken across for the day. After a wonderful morning,we return to our hotel just in time for a massive afternoon downpour. We huddle up and watch three hours of ‘Friends’, muting the sound every now and then when there’s some inappropriate dialogue for our son. Next day we spend at Cocoplum. The beach now actually lives up to its reputation. It’s private, quiet, and the water’s perfect. 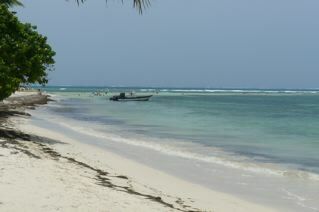 There’s an old shipwreck about 100 meters out which you can virtually walk to on a sandbank. The water is shallow and very calm, and just great for kids. 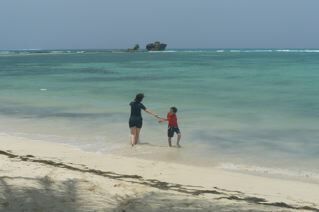 In fact the whole San Andres experience is one I would repeat tomorrow with kids. Reluctantly we pack up and head for the airport. We’re going to Cartagena, probably predestined to be the highlight of our trip, but leaving the Caribbean to go to a steaming hot city to start learning Spanish doesn’t feel as appealing as it once did. It also illustrates what I’ve always felt about designing city/beach trips. Do the beach part last, because leaving to go to a city will be hard. A year before, we left the Caribbean, Honduran island of Roatan to go to Tikal where the heat exhausted and withered us and would have made far more sense in reverse order. Avianca is very smooth in every capacity and we touch down at 8pm. We’re staying in the city walls in the San Diego area and as we get close, we get our first glimpse that this is a wonderful city. 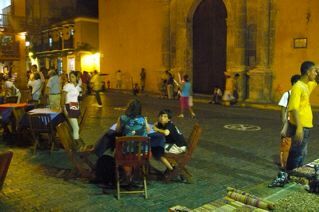 There are outdoor cafes, restaurants and markets, with people everywhere, and the city just oozing life and energy. Our hotel is the very popular Tres Banderas where they greet us with a drink and cold towel. We’ve only been outside for 5 minutes but are sweating profusely already. But our spirits are good, and we head out for dinner.We find an Italian place – our area is covered with restaurants, all pricey- get back to our hotel and get ready for the next adventure tomorrow.